Many older homes are wired with a hot and neutral wire without a ground. These include the old knob and tube wiring and in the early days of romex 14-2 without a ground. 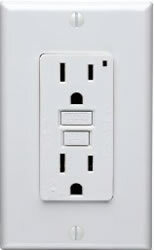 Many individuals believe that GFCI (ground fault circuit interrupter), in either the receptacle (Figure 1) or breaker (Figure 2) style cannot be used on a 2 wire circuit. A GFCI device does not need a separate ground wire in order to operate. Hence, all homes should utilize GFCI devices in bathrooms, kitchens and outdoor receptacles. The same situation applies to an AFI circuit breaker (Figure 3). There is no need to have a separate ground wire in the circuit for the device to operate. AFI devices are not available for the very old style knob and tube load centers or for fuse panels, as well the neutral wire must be bonded (connected) to ground in the service panel. 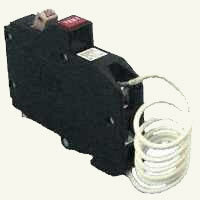 GFCI breakers can only be mounted in load centers designed for circuit breakers. However, GFCI receptacles can be used no matter what style, fuse or breaker, service panel you have installed.